Anjeanette took our daughter’s senior portraits. We were more than pleased with the results! Her photographs were creative and fun & they captured our daughter’s true personality. All of the photographs were phenomenal! Anjeanette also has a great personality. She put us all at ease during the process and made it a fun day to remember. Our family will be using her for anything we need photographed in the future! Not sure what to expect? Click here for the full story- the Anjeanette Photography Seniors welcome booklet! MOST client invest $450, Senior memory pricing begins at $250. Some invest between $450 to $1000 for their portraits. Some invest more while others choose to spend less. We can put together the best products to showcase your memories at any budget! You can always add on gorgeous high quality prints for parties and walls as well as the included gallery download! Why should I have Anjeanette Illustration take my senior pictures? The first and most important thing is individual attention. Graduating from high school is a major event in your life and you will get individualized attention to create special images just for you. Choose me if you like my style, and like the photos you see! In fact do NOT choose me if there is another photographers style you prefer- choose them. Basically, look at your photographers choices via blogs, an online portfolio or on social media. This site is mine! Expect that what you see from a photographer is what you will get for your memories- then book the person who will give you what you want for your once in a lifetime senior memories. You have to look at these photos hanging in your parents homes basically the rest of your life after all! I would just love to be a part of your memories. Do you charge more than the school photographer? Check your school’s guidelines for yearbook headshots. If you are allowed to select your own image to submit from your senior portrait session, then we can photograph any type of image that you would like for your yearbook. I can photograph tux or graduation gown headshots, however IF you supply the garment. I have Drape options and pearls for ladies. Most quick changes can be done in the standard two hour senior session. If you are wanting to wear your hair in two distinctly different ways – such as curly and straight involving tools and product hairdressing-you will need to book extra time in order to account for the time involved to change your hair during your session. If you are simply wanting to change up your look a little during your session – such as pulling part, or all, of your hair up for certain outfits – you can absolutely do that during a regular session. I LOVE variety and love to show off your multiple styles. How many poses can I have? You are not limited to a set number of poses. Once again we are not the high-volume yearbook photographer. Your session is tailored to your individual need, the clothes you have and the props you bring. I pack as much into a two hour session as I possibly can, and we can always stay longer to get you what you want! Bring as many outfits as you can carry! As MANY as you like! Our sessions are based on time, NOT on the number of outfits you are limited to. In general, we can typically photograph 3-4 outfits per hour, however this is entirely dependent on you. The more time you spend getting ready between outfits, the fewer outfits we will get to, and vice versa. We encourage you to bring LOTS of options – we will assist you in selecting the best variety of looks to make your senior portrait session the best experience it can be.I get a lot of my inspiration from your outfits, so go crazy. The more outfits you bring, the more options we have for portraits. Even clothes you may not like can look awesome in a photo! It’s way better to bring too much than not enough. Please do, I welcome you to bring clothes and props that represent your personality and activities! I get really excited when someone brings along something that will make their portrait session different from everyone else’s. I guarantee that your session will not look exactly like everyone else’s, and the more props the more ditinct yours will be. What do sessions or packages cost? Consultation about your interests & ideas. Consultation about your interests & ideas including travel plans for two plus days across the continental states and beyond! What can I expect during my photo session? The length of the shoot will be about two hours not counting travel time. If you have an iPhone or iPod we can listen to your music. Parents and friends are always welcome. The one thing you can absolutely expect is to have an AWESOME time! There will be cool, serious looks, and silly ones, you'll laugh and groan at my terrible jokes. Need more info? 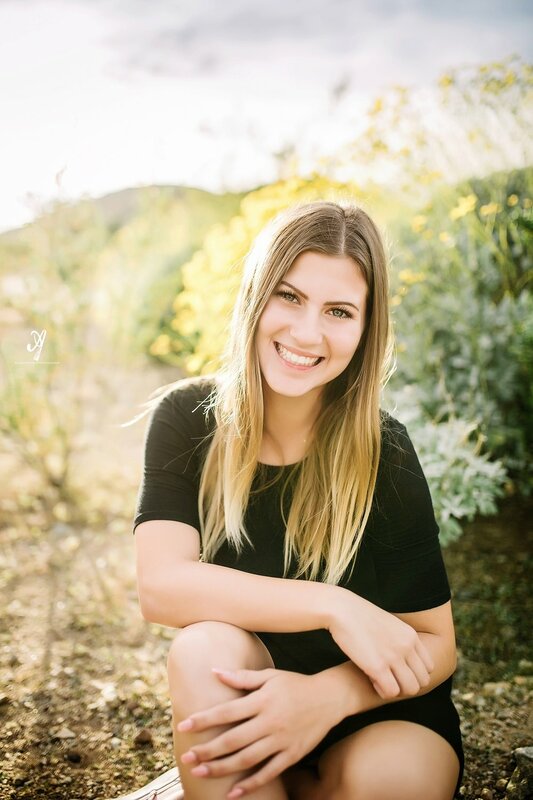 Here is my Arizona high school senior welcome magazine! Do I have to do cheesy poses? Only if you want to :) The whole point of your portrait session is to make you look like you. Never feel obligated to do something you’re not comfortable with. Do not worry! Almost everyone has days with less than perfect skin. Applying makeup properly can help make sure your preview images look their best. After you have selected your final poses I go over each image to remove minor skin blemishes. This is one small part of what is involved in creating your finished prints. Most braces can be removed at this time but only for the final prints and not for the previews. Removing blemishes, straightening and whitening teeth are just some of the things that I provide to make your pictures look their best and am experienced in a variety of flattering poses and techniques if you are less confidant about posing. However, I do not do extensive body modifications: my policy is that if its temporary I remove it. If its permanent it stays! Be loving and accepting of who you are and the natural beauty you posses. I am located in Deer Valley- Peoria & Glendale Arizona. I also cover Phoenix, Az. I relocated from Hendersonville, Tn home of Johny Cash. I am available to travel throughout the Phoenix area. Yes to both! I specialize in rich artistic location settings, and am available for location photography and well as a mobile 'studio' that can be set up in home or near the location for fashion-inspired, dramatic in-studio portraiture indoor/background looks– from urban settings to custom locations, we create the senior experience that YOU want. I photograph with both natural light and fashion studio lighting – I want to make sure you have a variety of looks to show off your individual style. On location we also photograph with numerous location lighting techniques – from fashion lighting to natural light and more. Photography is the art of ‘painting with light,’ and my goal is to make you feel as incredible as you look! As my schedule allows for a limited number of sessions per year, I must turn down other clients in order to provide the services agreed upon. Thus a non refundable retainer of $75 is due at booking (via card, check, or cash) to HOLD your appointment. Absolutely! We photograph almost as many guys as we do girls each year! We love showing off the individual style of our guys, whatever it may be – fashion, sports, urban, skateboarding, techy, whatever your style is we love to focus on having fun and showing off YOUR individual style. Do I have to come in for a consultation? Can’t I just book a session by phone ? All packages Include an online gallery of beautifully edited images, .. All images are archived for at least six months. What about evening and weekend appointments? If you want a specific date or time or year book early! Don’t I have to use the school yearbook company? No, you do not have to go to *JUST* the school yearbook photographer. But I think you want to do BOTH! The schools portrait company is hired to take your yearbook mug-shot, tux or drape, and cap and gown. Unless otherwise stated that is the image they will use in the yearbook regardless. You are so much more than one shot! Honestly, I love and have taken the traditional tux and drape shot. Its a classic! So get it and enjoy that....I suggest getting the school approved portrait package for a formal yearbook shot......but what about YOU? Your hobbies and passions? Some schools allow independent photographers images- like mine- to also appear in your book. Regardless an individualized senior session is an important milestone. All other photographs beyond one formal headshot from the schools photographer will be fast, cookie cutter images, and they are completely optional to purchase! I encourage a classic formal portrait in cap & Gown or Tux or Drape- its a milestone shared by your parents and grandparents, an iconic part of the senior experience. But wait- there can be so much MORE! After the yearbook formal add the real you personality and artistic Modern portrait from Anjeanette Photography! You are free to make your choice about your senior photographer! I encourage you to look around at several talented, small, independent photographers such as myself in your area. Make a decision based on the quality of their work. You will get better quality images, more time spent with you and more poses to choose from if you use an independent photographer with years of training and artistic experience. The yearbook photography companies are usually high-volume studios that profit from getting students in and out quickly with just a few backgrounds- the same ones all of your class will have. You’ll still pay big bucks for your senior pictures, but what you won’t realize is that you are paying for the business name. Consider your options. In the world of digital imagery, why would a studio only let you pick a few poses? Independent photographers will provide you with lots of options and will take the time to individually edit your images. They will take pride in their work because the images they produce will be a direct reflection of their abilities. I’m ready to book my session. How and when should I do it?